The intruder had signed himself in as Daran, a researcher for the Labour Party MP Siobhain McDonagh, though he told me that he was a freelance journalist called Canaa, and later tried to deny that he was a researcher for the lady. The High Commission described him as an LTTE supporter called Canaan, but it is possible that he was simply a misguided young man who got involved with terrorists when they seemed on the ascendant. Certainly he told me that he was responsible for the telecast of what purported to be an interview with Dr Shanmugarajah, that was used to spread horror during the last stages of the conflict. Having however told me that he would send me the visuals that went along with that interview, he got cold feet and told me ‘This is Daran. after careful consideration , I cant give you that entire video. But I have attached the sample one’. I suspect this was because, had he sent me what he had promised, it would have revealed from where Channel 4 had got much of its material. However, perhaps as compensation, he sent me another clip, which seems as blatant an example of doctoring as what Channel 4 had shown, even though Daran persisted in claiming that it had not been edited. But editing selectively is the speciality of these frauds. I reproduce here the text of the Sri Lanka Guardian, with contradictory sections from the translation I got of the original Athirvu article highlighted in brackets (though it can be seen that even that article was internally self-contradictory). What actually happened can be seen in the article entitled ‘Siobhain McDonagh’s researching journalist’ (dumbfounded silence indeed) on my blog, www.rajivawijesinha.wordpress.com and on the video of the event that can be seen on www.youtube.com/rajivawijesinha – extracts from this that contradict what Athirviru and the Sri Lanka Guardian say are in italics, and their accuracy can be seen on the video [Part 1, Part 2, Part 3]. 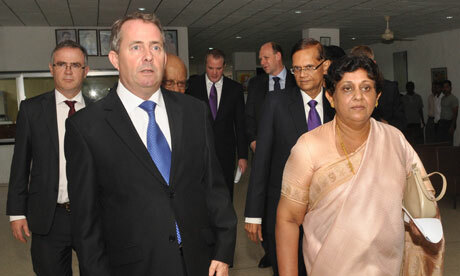 Incidentally, it was the Sri Lanka Guardian that originally tried to suggest that the House of Commons meeting was arranged by Bell Pottinger, and that Liam Fox was involved in stopping Channel 4 from talking about it, or some such nonsense – part of what I described as the irresistible attack on Liam Fox, which seems to have originated with someone passing on to the Guardian a photograph taken in Sri Lanka. The anxious efforts to suggest that he lost his job because of the Sri Lankan connection make clear the message the Tiger rump wishes to send out. There was instruction that no one from C4 should be allowed. However, a C4 journalist who was involved in the production of their ‘Killing Fields’ asked embarrassing questions. ‘Following her, Aithirvu reporter was given the opportunity to ask questions. He asked: ‘You have produced a documentary to counter the C4 to get the support from western countries, why can’t you allow an independent inquiry demanded by the west? Whilst the presenter maintained silence Hansa (Deputy High Commissioner) from the first row butted in and took photograph and video recording of the Athirvu reporter with the view to threaten him. 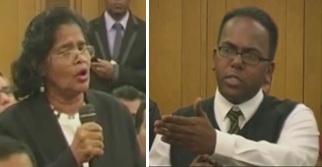 (When the Sri Lankan spokesperson avoided a direct answer to that question Mr. Amza who was seated in the front row intimidated the journalist by indicating that he is being videographed.) However, the Athirvu reporter went on to ask another question. ‘There were about 150 Sinhalese and only 3 Tamils. Whenever Tamils raised a question, the Sinhalese shouted, humiliated and insulted them (See previous paragraph for internal contradiction – Another blatant falsehood was the claim that one of the Tamils present condemned me for talking about ‘Tamil terrorists’. In fact, as the video footage makes clear, he was talking about an intervention from the floor, and I in fact supported his plea and asked that all of us, however emotional we felt, make a distinction between the terrorist Tigers and the Tamils, whose welfare as equal citizens of Sri Lanka must be supported.) Even when the C4 lady was asking questions, they were behaving like this. ‘The pro government tail wagging Tamil woman Rajeswary (known as Drama Queen) was saying Tamils should be allowed to live peacefully (‘She also blamed the leadership of the LTTE.’ The others, Tamil as well as British, who made a similar point are ignored) and the C4 documentary will only help to seed another war in Sri Lanka. She went on to slam the Tamil Tigers and its leadership.